Acquisition represents inaugural expansion of unique Peerage partnership model to the United States. TORONTO, ON and DENVER, CO – January 16, 2019 – Peerage Realty Partners Inc. (“Peerage”) announced today that it has acquired a strategic partnership interest in Madison & Company Properties, LLC (“Madison”). Founded in 2008, based in Denver, Colorado, Madison is a leading independent brokerage with a strong tradition of exceptional service and professionalism. Madison represents Peerage’s inaugural partnership in the United States, where Peerage anticipates making several investments in 2019 and beyond. Todd Narlinger, Founder and CEO of Madison, will continue in his role as CEO and retain a significant equity stake under the unique Peerage partnership model. Terms of the transaction were not disclosed. 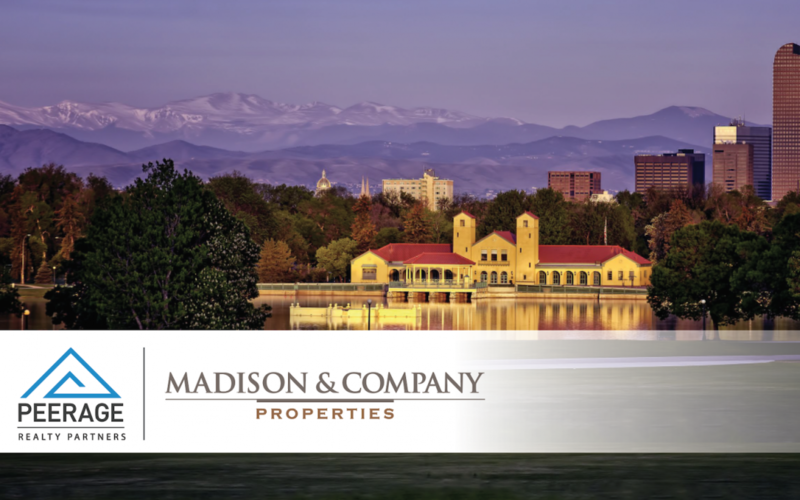 Founded in 2008, Madison & Company Properties is one of the leading boutique real estate firms in the Denver metropolitan area, servicing both the residential and commercial markets. With seven convenient Denver area locations, Madison is comprised of approximately 150 experienced and knowledgeable real estate brokers and staff who provide our clients with the highest level of personal service and expert advice. Madison holds the number two spot with the second highest production per agent in Denver, and has been recognized as one of the Top Workplaces by the Denver Post for 5 consecutive years, and ranked #1 in 2018. Peerage Realty Partners, a subsidiary of Peerage Capital, offers an innovative alternative for independent real estate firms. Transacting over C$7 billion in annual sales, Peerage embraces the entrepreneurial spirit of our partner firms by encouraging autonomy while providing human and financial resources to accelerate growth. In addition to Madison, our partners include: Chestnut Park Real Estate (one of the top luxury firms in Canada and the exclusive Christies affiliate for Toronto and surrounding areas), Baker Real Estate, the leader in new development and condominium sales and marketing in Ontario and Montreal, Fifth Avenue Real Estate Marketing, a leader in new development and condominium sales and marketing in British Columbia, and StreetCity Realty, a progressive brokerage with 10 offices in Ontario. Peerage Capital is a leading North American business services and private investment firm. We are focused on partnering with exceptional management teams over successive generations to form long-term investments across several strategic business services platforms including real estate services, real estate, asset management, wealth advisory services, and land assembly. Our growing network of partner companies employs over 1,000 people across Canada and the United States with over C$7 billion in total assets under management and administration, and transacting over C$7 billion in annual sales of residential real estate. We believe that superior talent is the ultimate driver of long-term growth and success. Accordingly, we operate with a strong culture of partnership, collaboration and alignment of interests, both economically and culturally. Our unique Perpetual Partnership Model has been refined over 38 years to accelerate growth through value added services that enhance the sustainable, profitable growth rate of the organization, thereby maximizing shareholder value.